I just added RTI – Response to Intervention in the Categories section. Get THOUSANDS OF PAGE VIEWS for your TpT products! Let the power of the group help you create and market your TpT products! Educating Everyone 4 Life has earned $44,887.69 in just 8 months since joining The Best of Teacher Entrepreneurs Marketing Cooperative! Click on the button above to download TBOTEMC’s preview to read her letter and see the amazing statistics of life before and after she joined TBOTEMC. 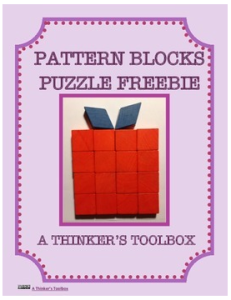 This is a pattern puzzle that can be used for students in K-5. Included are two versions. The PreK-K Version has the outline of each pattern block used in the puzzle. The Grade 1-2 Version only has the outline of the puzzle, which allows students to explore other shapes to complete the puzzle. Pattern block pieces and answer key is also included!